As you move ahead and gear up for what's next, we're here to help with a $400 bonus toward the lease or purchase of a brand new Hyundai. Valuable offers for recent college graduates also include a Design Your Own Payment4 feature. So book your appointments. Go on your job interviews. Take your power lunches. With the right moves, you've got a Hyundai that will get you there. This Hyundai College Grad Program Offer (the "Offer") is limited to well-qualified customers who meet all the following Offer criteria, and who finance the purchase or lease of their new Hyundai, subject to credit approval, through Hyundai Motor Finance (HMF). 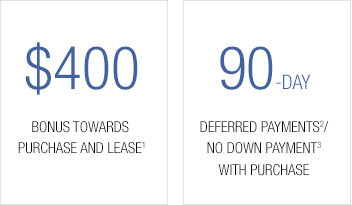 Offer applies to all new 2016 and 2017 Hyundai when purchased or leased through HMF. Only available at participating Hyundai dealerships. Must have graduated with a Master's, Bachelor's or Associate's degree from a U.S.-accredited college or registered nursing school within the past two (2) years or will graduate from such a school within the next six months from date of finance contract. No adverse credit history. Verifiable proof of employment or firm commitment from an employer with start date no more than 90 days from date of finance contract. Offer valid through January 2, 2018 (HMF finance contract must be dated on or before January 4, 2017). 4 Design Your Payment option: Eligible lease and finance purchase customers can select the monthly payment amount option that best fits their budget from available options. Residual value on lease contracts will be adjusted accordingly, but standard mileage amount cannot be adjusted for extended lease terms. See dealer for details.